Windows updates are essential for any system running Windows OS. It helps fight against difference malwares, help us to stay updated with the latest app releases. It also boosts the performance of the whole system. Also at times, it fixes various issues like service registration is missing or corrupt error. However, on one side, there are many users who have enabled the windows updates. On the other side, there are so many users who have turned it off. But in case if you have turned the Windows updates and not being able to update your Windows OS then there is a serious issue waiting for you. Nonetheless, you can fix the issue by using the troubleshooter. But sometimes troubleshooter fails to fix such issues. In this section I’ll walk you through all the actionable methods that will help you get rid of this error quickly. The first method is to run the sfc/ scannow command. Since the error most of the time occurs because of corrupted system files, and the best way to fix this issue is to use some CMD commands. Step 1: First of all click on the Windows Icon located at the top left corner. Step 2: Now type down CMD to look for the Command Prompt. Step 3: Right click on CMD and select the “Run As Administrator” option. Step 5: Once completed, simply restart your machine and you are done. 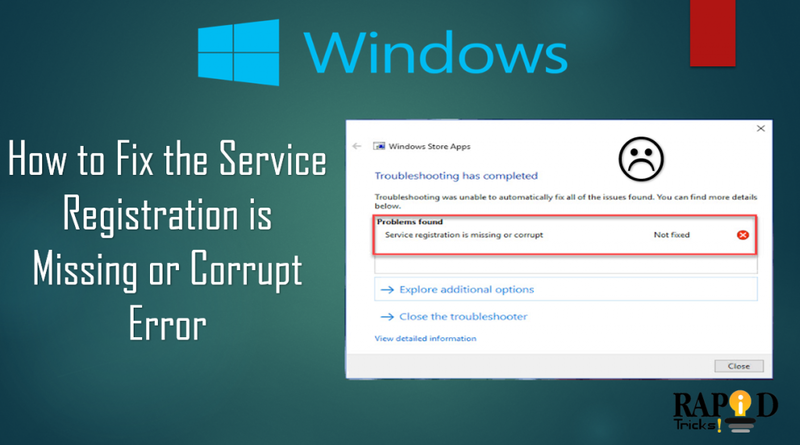 After that check if you are still getting the service registration is missing or corrupt error or not. There is a common problem that Windows users often face which is the windows update related service gets stopped for no reasons. Step 1: Press Winkey+R key altogether to open the run dialog box. Step 2: In the box, you have to type down services.msc and hit the enter button. Step 3: This will open the services window. From here look for the Windows Update service and double click on it. Step 4: Then you will find a new Window from here go to the startup type and select Automatic. Step 5: Next up save all the changes that you made. Step 6: Also do check if the service status is stopped or not. If it has stopped click on the Start button to start the service. After that save the changes. Step 7: If the service is running, then click on the stop button and start the process again. Step 8: In the end install Windows update again and see if it has fixed the issue or not. Step 1: First of all click on the Windows button. Step 2: Search for CMD. Step 3: Run CMD with administrator rights. Step 4: Now run these commands one by one, and you are good to go. Step 1: First of all open control panel. Step 2: Now from the right left click on View by and select small icons. Step 3: Over here you have to look for the Windows Firewall option. Step 5: From the sidebar select Turn Windows Firewall on or off. Step 6: Then click on yes button to turn off the Windows Firewall on, and you are done. Step 7: In the end try to run Windows update again and see if it has solved the issue or not. Most of us have an antivirus program installed on our system, and it’s good to have one. However, in some cases, antivirus is the only one that causes issues. So in case if you have an antivirus program installed on your machine, do consider disabling it for a while. You can do so by going to your antivirus program’s settings. Once you are done disabling the antivirus program simply re-run the update process and see if you are still getting the service registration is missing or corrupt error. So those were all the fixes for the service registration is missing or corrupt error. Now it’s your call to try these steps by yourself and see if it is working for you or not. Also if you need further assistance, you are free to leave a comment below and let us know.